Many species of birds pass through Terra-Cotta Natural Park, and the number of species present varies over the course of the seasons. There are 25 species in fall, 16 in winter and 42 in summer. For some time now, hikers have been able to see and photograph Great Horned Owls, which may be in the park at any time of year. 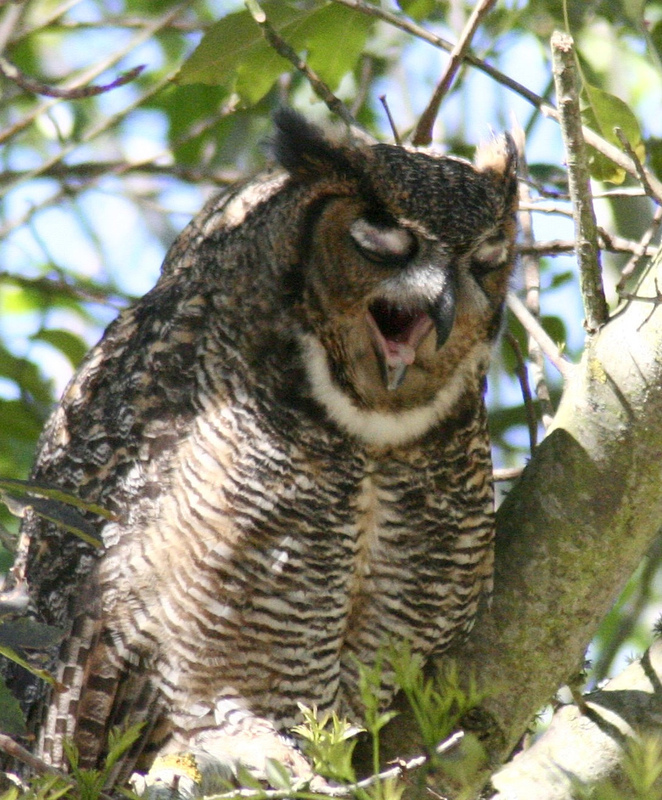 The Great Horned Owl is one of the largest owls in the region. It can be recognized for its large size, ear tufts and facial disc, which differentiate it from other owls. The Great Horned Owl seeks a wooded or semi-wooded environment as its hunting grounds, which it vigorously defends. Terra-Cotta Natural Park is an ideal habitat for this species because it offers a wide variety of prey. This owl usually hunts in the same territory, ranging from eight to ten square kilometres. If there is a shortage of food, it will migrate up to 250 kilometres to the south. During the day, the Great Horned Owl can be seen resting, as it is a nocturnal bird. It is usually perched on a branch or in a hole in a stump, its eyes half-closed and its ear tufts upright. It awakens in late afternoon and remains active until dawn. At dusk, it can be seen perched in more visible places, marking its territory with small hooting sounds. Once night has fallen, it begins to feed. 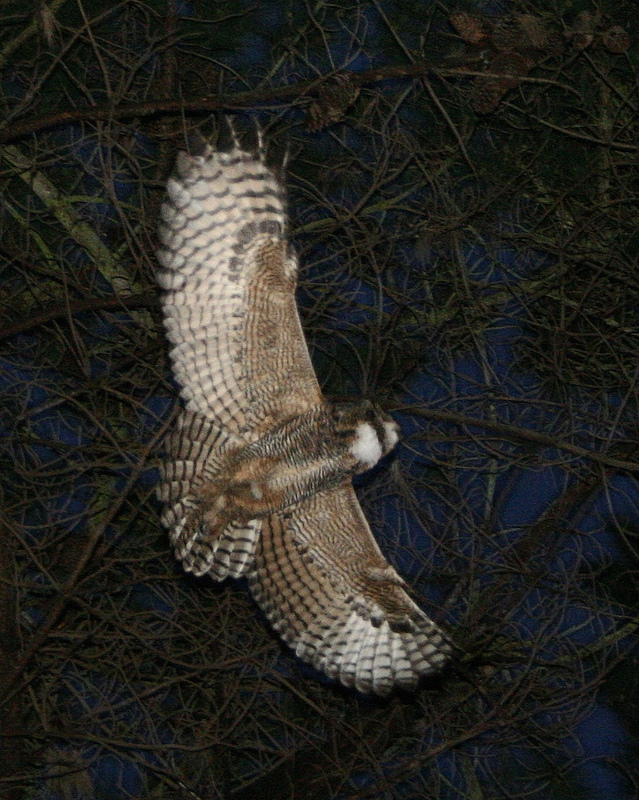 Keen hearing, sharp eyes and very silent flight, thanks to downy feathers, make Great Horned Owls excellent hunters. They usually perch on the edge of the woods to keep watch. They can also detect prey while in flight and plunge to the ground to seize and ingest it. 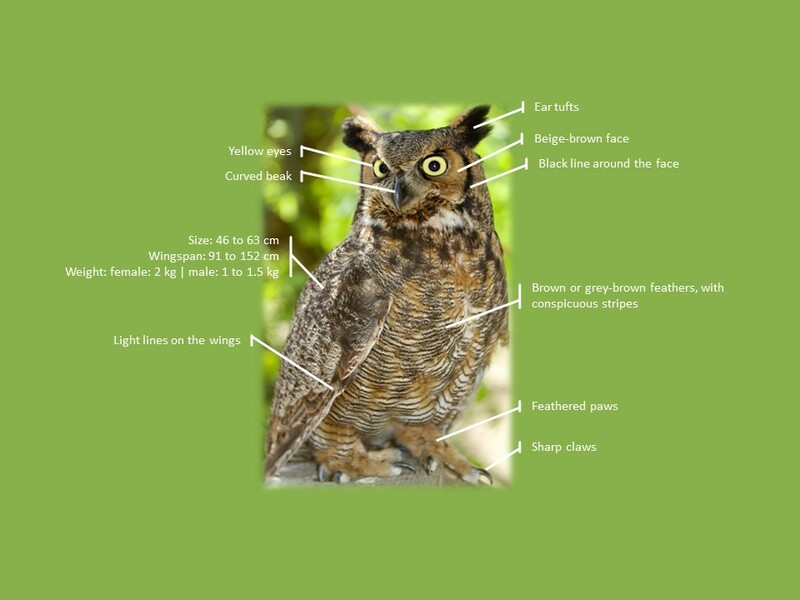 Great Horned Owls feed mainly on birds and small or medium-sized mammals such as mice, voles, hares and skunks. If the hunting goes well, they store their catches for future meals. Digestion may take six to twelve hours, after which the bones, feathers, teeth and fur are regurgitated as pellets. The pellets allow for a thorough analysis of the owl’s diet. Toward the end of autumn, the Great Horned Owl’s courtship ritual can be seen and heard. It involves cries and noises made by the couple, which normally remain together for life. During the ritual, the male tramples the brooding spot, hooting. They normally choose the abandoned nest of a crow or large bird of prey, in the hollow of a tree trunk, but they may also nest on a cliff ledge, between rocks or in a hole at the base of a large tree. They put little effort into building or repairing the nest. Because the movements of brooding owlets damage the nest, the owls do not remain in the same spot from one year to the next. The female generally lays two to three eggs, and up to six, and remains in the next for 23 to 25 days to hatch them. During this period, the male hunts for both of them. Once the eggs have hatched, the downy white owlets stay in the nest until their eighth week. During this time, the parents may be more aggressive to protect them. After about eight weeks, the fledglings begin to fly short distances and are capable of independent flight around the twelfth week. Due to predators and falling from the nest, only one owlet in two reaches the age of two, when they are ready to form a couple of their own. They leave their parents in the fall, and most stay within 80 km of their birthplace. 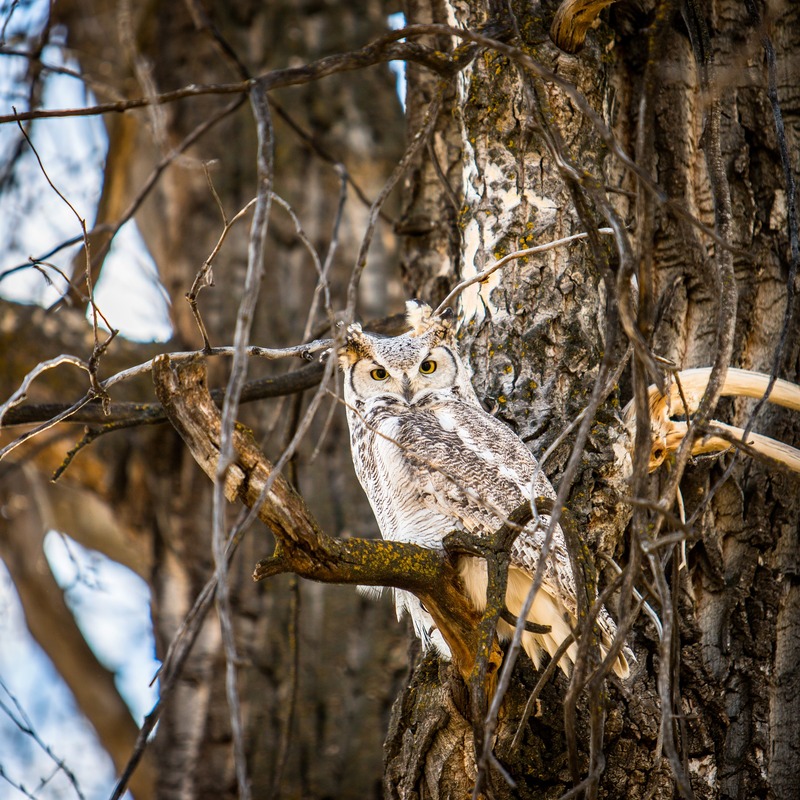 On your next evening walk, keep an attentive ear open for the hooting of the Great Horned Owl. You might be lucky enough to spot one!